Las Palmas Escape welcomes you to this stunning 3 bedroom, 2 bath, newly remodeled private beach home. Set upon a street made famous for the rows of tall swaying palm trees in the beautiful Windansea Beach neighborhood of La Jolla, you are sure get swept away in all that this home has to offer. Extensively remodeled both inside and out with clean and crisp decor, it is indeed designed for pure relaxation. At sunset walk to the end of the street and watch nature's finest moments. Las Palmas Escape welcomes you to this stunning 3 bedroom, 2 bath, newly remodeled private beach home. Set upon a street made famous for the rows of tall swaying palm trees in the beautiful Windansea Beach neighborhood of La Jolla, you are sure get swept away in all that this home has to offer. Extensively remodeled both inside and out with clean and crisp decor, it is indeed the perfect vacation escape as it is designed for pure relaxation. Just walk to the end of the street and take your choice of beaches, perfect for the surfer or sunbather. You will enjoy the rugged coastline, sand, surf and the endless views during your stay here. Sunset watching is the best in town here and the perfect way to end your day. Your own private pool with bubbling hot Jacuzzi awaits you after a long day at the beach or sightseeing. Pool has gated access from the front door of the home. 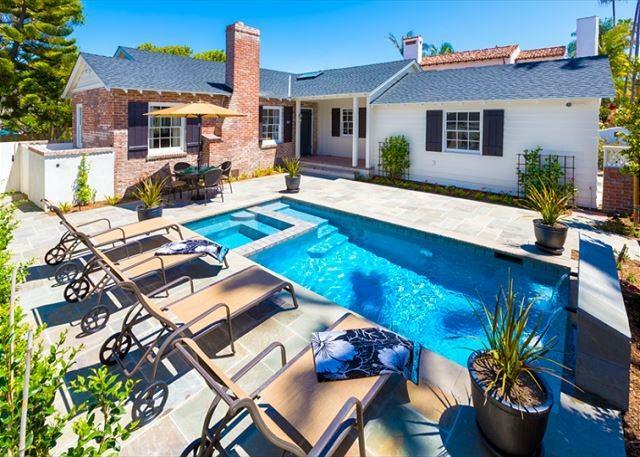 As you open the front gate and enter the impressive courtyard, complete with plenty of lounge chairs and poolside dining table, you will truly experience what southern California outside living is all about. Listen to the giant palm trees whisper in the ocean breezes as you relax and revive by the pool on lazy afternoons. 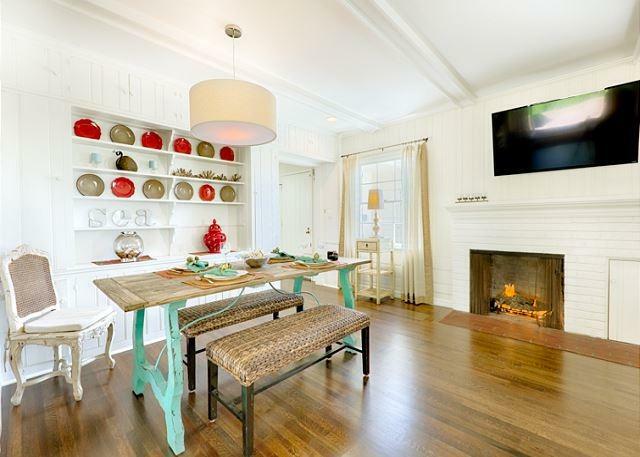 The living room and dining room combination is open to the kitchen to make this home feel airy and spacious. This is the perfect set up for entertaining family and friends. The living room features a large flat screen TV, gas fireplace for chilly evenings, and comfy furnishings in a fun and casual coastal dÃƒÂ©cor. The dining area has a generous sized table with seating for 8 people. 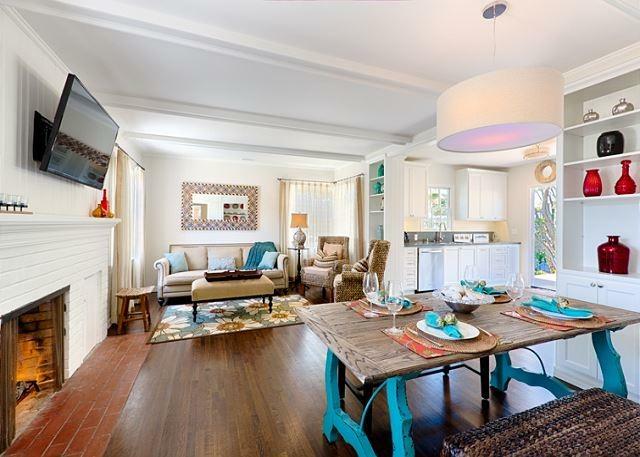 There are hardwood floors throughout the home, beamed ceilings and classic California design accents. The spacious kitchen is newly equipped with all new, top of the line appliances and gas range. Folding doors in kitchen open up the entire wall, leading onto the large outdoor back deck. An outside dining space for 8 people, and more casual seating make for afternoon family BBQÃ¢â‚¬â„¢s and just lounging in the shady back yard. The pristinely manicured lawn and resort style swimming pool add an air of luxury to the home. The private master bedroom is located in the back of the home with French doors that open onto the deck and lush garden views. Enjoy the California king sized bed, premium bedding, flat screen TV, ceiling fan, and generous closet space in this peaceful room. The private bath has a dual sink vanity and an extra large walk in shower stall with bench seating and a rain shower head. The second bedroom also features a king sized bed, flat screen TV, and ceiling fan. The third bedroom has 2 queen-sized beds, great for the children. This room also is equipped with a ceiling fan and looks out to the pool and courtyard area. The main bath in hallway has a tub, shower, and a dual sink vanity. Other amenities include central air conditioning, garage, off street parking, washer and dryer, high speed Internet, Cable, and WI-FI. One amazing bonus to this home is that it is just a half-mile walk to the Village. With several local eateries and convenience stores at the top of the street, you are close to everything! Stay at La Palmas Escape and experience La Jolla coastal living at its best for your beach vacation. Please note that this home offers air conditioning at no additional charge. There is a $60/day fee to heat the pool to 85 degrees and there is no charge to heat the spa.